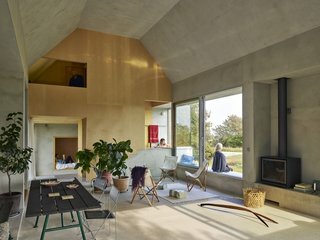 A charming, small-scale house wins Sweden’s oldest and most prestigious architecture award, beating out Bjarke Ingels Group and Wingårdhs. 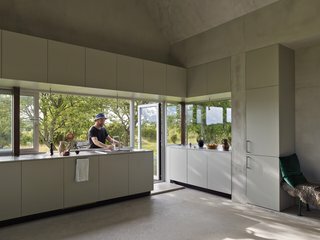 When artist Birgitta Burling and her husband Staffan decided to build a house on the idyllic Swedish island of Gotland, they set their ambitions high. "The brief was to make a house that can do several things…to create a house with very little boundaries and infinite possibilities," says French architecture and landscape firm Collectif Encore. 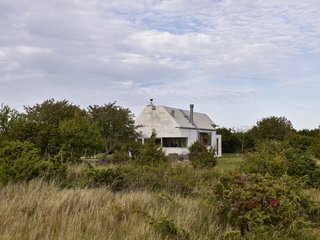 Located on the Swedish island of Gotland, the house is designed to look like a large boulder to blend in with the landscape. "It is a stone among other stones," the designers say. Having previously worked together with Birgitta and Staffan at the KTH School of Architecture in Stockholm, Collectif Encore architect Anna Chavepayre was a natural fit for the project. Moreover, she was delighted with the fairly open-ended brief that called for a flexible, multipurpose space—it's the very type of project Collectif Encore endeavors to work towards. Collectif Encore designed the house for energy efficiency. It's composed of LECA blocks, which provide superior thermal insulation. The facade is plastered light gray, and the roof is made from wood. The result is the Hamra studio residence, a live/work property that changes with the seasons. In winter, Hamra’s primary building—a 1,400-square-foot structure plastered gray to mimic a boulder—serves as a one-bedroom residence. 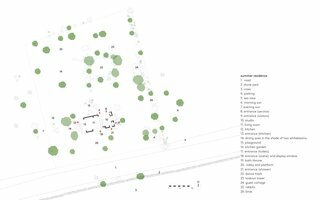 As the weather warms, the program expands to 30,900 square feet to include a studio for two artists; a small lookout tower; a guest cottage; and a grassy field with a dance track in the garden where performances, exhibitions, and outdoor events are held. The interior is finished with the same materials and colors as the exterior. 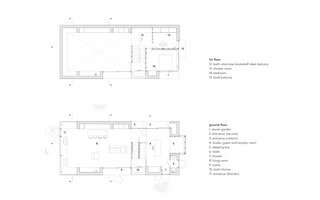 In winter, when Hamra is used as a one-bedroom residence, only the private part of the house (delineated by the timber surfaces) is heated. Versatility is also cleverly embedded into the house through an approach Collectif Encore calls "living within the walls." At Hamra, the walls are more than a means of dividing space; furnishings and appliances built into either side of the walls add space-saving functionality and flexibility. 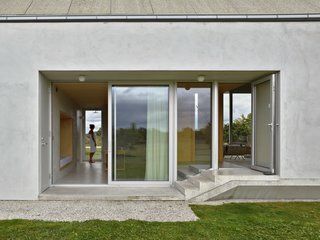 To minimize the home's energy footprint, the floor and foundation are made from cast concrete. Large openings allow for natural ventilation, while surrounding trees help create a cool microclimate. 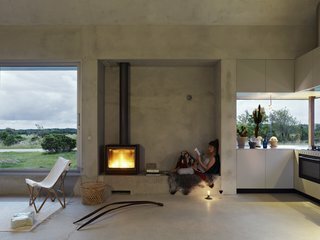 The house is powered by geothermal energy. In the summer, the kitchen counter transforms into an indoor/outdoor kitchen island. The outdoor dining room is located between two whitebeam trees. The thoughtful design earned Collectif Encore architect Anna Chavepayre and the commissioners Brigitta and Staffan Burling the 2018 Kasper Salin Prize—the oldest and most prestigious award in Swedish Architecture. It's the first time the prize has been awarded to a private house, and only the second time that it has been awarded to a female architect. "The exterior walls are not happy with just being the limitation between interior and exterior," Collectif Encore explains. "You can shower, go to the toilet, stand on stage, cook, sleep and bathe ‘inside’ the walls." 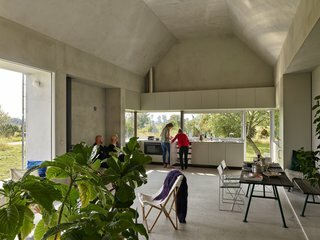 "[It’s] an ingenious house, which, with its wide variety of possible uses, private as well as public, is considerably larger than its square meters," explains the jury, which, after visiting the house in-person, selected Hamra over more famous projects such as Bjarke Ingels Group’s 79 & Park, and the New National Museum and Malmö Market hall (both by Wingårdhs). 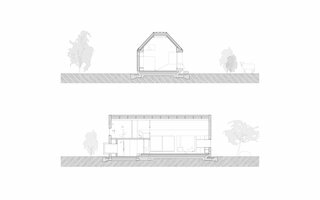 "As an experimental box, the house comprises unexpected solutions and experiences following on from an exploratory process. An uncommonly committed collaboration between architect, contractor and builder has resulted in a skillfully completed building replete with architectural qualities." In contrast to the home's "heavy" appearance, the interior feels light and airy. Large panes of glass frame views of a secret garden to the north and a clearing for events to the south. "Every part of the house can ‘do’ more than one thing," explains the design studio. "The stairs are not just a staircase. They are a laundry room, a bathroom, a bookshelf and workplace." "The images do not give the context," adds Thomas Sandell, president of the jury. 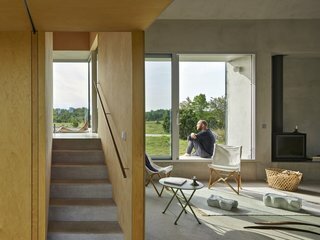 "There’s a lot in this studio that, in a very smart way, puts an end to the usual rules we, architects, use when conceiving a house. Many villas in architectural history have shown a new way forward and pointed out a change of direction—including most of Le Corbusier's villas and Villa Mairea by Alvar Aalto. And I am convinced that this villa is such one." Every room can be directly accessed from the garden. The house has six entrances in total. On the ground floor, this multifunctional room serves as a studio, a guest room, and a laundry room. The floor above holds the main bedroom, the main bath, and a workspace. "The project is not about designing this or that but rather creating the conditions for freedom, generosity, and invention throughout all spaces and situations," says Collectif Encore. "You can’t buy the qualities in this project like you buy a sofa for comfort. They come for free and are immaterial." 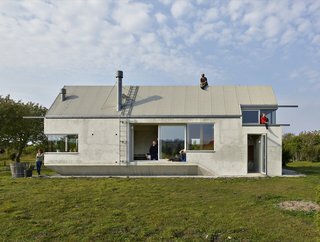 The accessible roof is the perfect place to take in views of the island and the Baltic Sea. "The biggest changes in life are not always physical, but rather how we manage to see things in a different way. I see the inhabitants and the landscape as entire parts of architecture. For instance, we don’t need to construct the sunset. It’s already there, and bringing it into the building is an economical way of constructing." 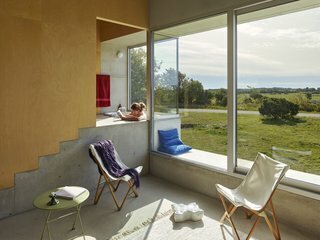 The bathroom window is strategically positioned so that views of the sea can only be seen when the user is seated on the toilet. 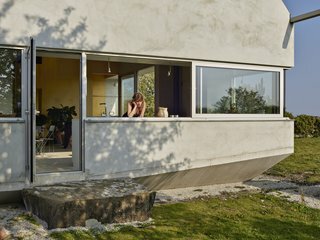 The clients' request for a mouse-proof house informed the shape of the home and the use of cast concrete for the foundation.